Can Massage Help A Cold Or Flu? Can Massage Help Recover From A Cold And Flu? During the cold and flu season, clients often ask me if massage therapy can help them recover faster. As a matter of fact, receiving massage while your body is fighting an illness may worsen your condition. I know you are suffering! The congestion in your chest is unbearable. The force caused by coughing and seizing makes your muscles tight and sore. Additionally, the flu-related pain in your muscles and joints make you feel exhausted and cranky. While you’re desperate to get some relief from your symptoms, massage therapy isn’t the way to go. Massage therapists are not trained to diagnose, treat or cure any illnesses, and we have no ability to correctly assess your condition. Your best bet is to go see your medical doctor and follow their instructions. They can properly diagnose you, and ensure you are not developing any secondary upper respiratory system problems. You may need medication that will help you boost your immune system and fight the symptoms efficiently. 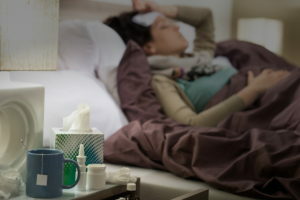 Let’s try to remember that both, common colds and the flu are highly contagious during their early stage of incubation and walking around sick is going to spread the virus. Therefore, when you first notice symptoms of illness, call and reschedule your massage, your therapist will be grateful. Marzena’s practice of massage therapy renders a mentally and physically healing experience. She leads with her indelible intuition, creates a trusting environment, while relying on her expert clinical ability. As a competitor in several running races and triathlons, I incorporate Marzena’s deep tissue massage therapy into my workout regime. This is a clear contributor to the fact that I have never sustained an athletic injury. I had also been a sufferer of migraine headaches. Due to the environment of trust she creates while relying on her intuition – through massage – I had a wonderful breakthrough. With this mentally healing experience, I am so relieved and delighted to say that I have yet to have a migraine headache since this point in time. Marzena is a true healer and massage expert. She understands and has compassion for the experience of pain in the body and knows how to effectively reduce that pain. She listens carefully to your needs as a client and always helps you consider varieties of strategies you can use besides massage to feel better. I have probably had massages from over 20 massage therapists in my life. Marzena is by far the best I have experienced. I highly recommend her services. Marzena has been our family massage therapist for almost ten years. During that time she has helped my husband and me nurse various injuries, recover from car accidents, and supported me with massage through my pregnancy. I have had monthly standing massages for the last three years. Marzena is very caring and talented. I’ve referred many people to her over the years and they have all become fans. Marzena is wonderful! I don’t like when I get those fluffy-soft massages that “do nothing”…however, Marzena does ALOT! She will get the knots out, work the areas of stress and is also inspirational to chat with during the process! I let her “cup” me when she thought I needed it, which I was afraid to do, but I trusted her. Amazing! Thanks Marzena! Marzena is a godsend. I have been seeing her as my masseuse for probably more than five years, and it is so good to know that she is there. I am a runner, and I often allow too much time to slip by between massages. When she does work my legs and lower back, I feel so much better, and my legs have so much more strength and freshness. Her deep tissue massage is the best – she really works the muscles deeply, but without too much pain (there’s always the good pain, when you know she’s making progress). She really knows my body and its needs – I feel totally safe and confident in her care. She is also more than a masseuse – she is a very deep listener and takes a holistic approach to me and my life. She knows it’s all connected! I have never had a better session with any massage therapist I’ve seen. Marzena was not only able to relieve my pain but get rid of every tight, knotted muscle in my back. Let it be known, when you ask for deep tissue from Marzena, it’s the real deal! I’ve paid a lot more at the well-to-do salons and they are not nearly as effective as Marzena. Also, I just tried cupping and it’s amazing. Not only did it work just as well as massage, if not better in some places, but I got to show off my war wounds. I recommend Marzena’s services to everyone I know, whether they have pain or just need to relax. See ya next week Marzena! Marzena – I can’t thank you enough for the massage work you’ve done on my body. I am definitely in optimum health. Your massages always continue to allow me to stay in awesome shape -body, mind and spirit. You treat the whole person and not just their body. I appreciate that. From a spiritual standpoint I am always attracting more and more business and clients right after a session. I am lucky enough to say that I’ve gotten massage therapy treatments from practitioners all over the world. I feel even luckier that Marzena, the best I’ve ever experienced, is located here in Chicago. What sets her apart is her ability to focus on my unique needs and preferences, deliver an extremely deep treatment, and share her knowledge and commitment to total wellness. I have been seeing Marzena twice a month since early 2006. She is professional, well educated and is as intuitive as a close friend. She is genuinely concerned with both my physical and emotional well-being. Through Marzena’s openness and commitment to my health and her practice, I have learned how my unexpressed hurt and anger can manifest in my body as physical pain. She has created a safe environment where I can be myself and trust her with what is going on in my life. She uses many different treatments such as aromatherapy, cupping, deep tissue and relaxing massage which have all been beneficial to me over the years. I am blessed to have a massage therapist that I love and trust in so many ways. Copyright © 2019 Massage Therapy Clinic | Back To Touch Massage Chicago. Powered by WordPress. Theme: Accelerate by ThemeGrill.